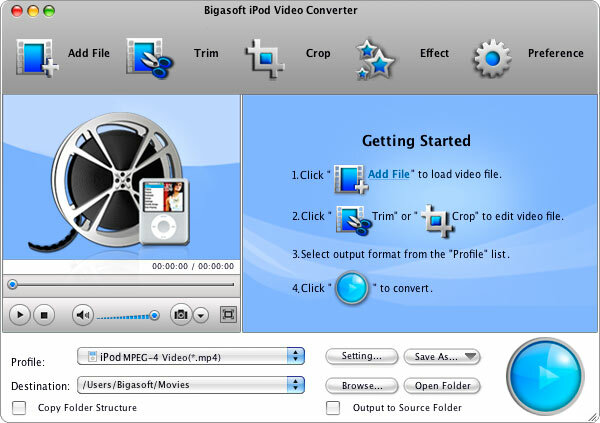 Bigasoft iPod Video Converter for Mac, a professional Mac iPod converter, is specially designed to convert all kinds of movie formats to iPod MP4 for playing on iPod and iTunes for Mac OS X Lion, Snow Leopard, Tiger, and Leopard. Besides, the Mac movie converter is equipped with more advanced features, you can easily play movie before converting, capture favorite images, rip movie segment, crop black margin, automatically shut down computer after conversion, convert files in batch mode, merge movies, rotate video to correct degree, add watermark to video, and more. The professional Mac iPod movie converter supports play on all iPod models including iPod classic, iPod nano, iPod touch, iPod touch 4, iPod shuffle, iPhone and iPad. 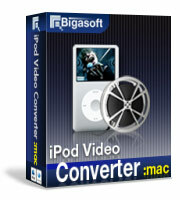 Free download Bigasoft iPod Video Converter for Mac and take unlimited enjoyment with you right now. 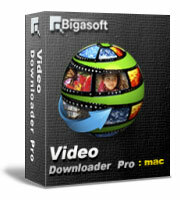 Ready to try or buy Bigasoft iPod Video Converter for Mac? iPod fans are no longer restricted to play MP4 files only now. The powerful Mac iPod converter can convert all popular movie files to iPod video MP4 to play on iPod, including MOV, MP4, MKV, AVI, DivX, Xvid, MPEG, WMV, RM, RMVB, ASF, VOB, 3GP, FLV, MOD, TOD, MTS, and more. The smart Mac iPod video converter can also convert music files such as APE, WAV, WMA, MP2, AC3, RA, M4A, OGG, and AAC etc. to iPod MP3, M4A with ease. 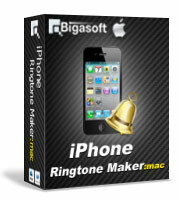 It can also easily extract audio from video and convert to put on iPod. The movie converter for Mac allows you to simultaneously preview movies to be converted before a lengthy process. You may set the start and end time to convert your favorite clips as you will. It can merge several movie files into one file to enjoy successively. The professional iPod video converter Mac enables you cut off the black edges and adjust the aspect ratio to make the video exactly fit your iPod. The wonderful Mac iPod converter is compatible with Mac OS X 10.4(Tiger), 10.5(Leopard), 10.6(Snow Leopard), 10.7(OS X Lion), 10.8(Mountain Lion), and 10.9(Mavericks).